I’ve been doing a lot of really fascinating research lately about the origins of yarn crafting. 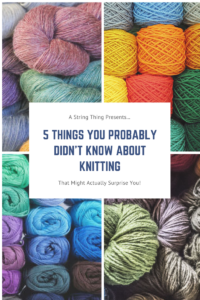 I couldn’t wait to share it with you, so here’s 5 things you may not have known about knitting! 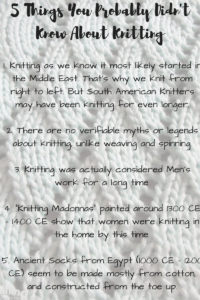 Knitting as we know it most likely started in the Middle East. That’s why we knit from right to left. But South American Knitters may have been knitting for even longer. According to many historians, knitting seems to have originated in the Middle East, or at least knitting as we know it. South American knitting seems to have developed on it’s own, and a lot earlier. South American pieces of true knitting can be dated back to at least 200-300 BCE, while the oldest known pieces of knitting in the rest of the world can only be dated back to 1000 CE. Now, there was probably knitting before that, but it often gets confused with nalbinding, so it’s really hard to be exact with dating. And that whole left to right thing? It’s been conjectured that since most knitting came from Islamic countries, and they read left to right, that’s probably why we knit from left to right. Crazy, right? There are no verifiable myths or legends about knitting, unlike weaving and spinning. Knitting was actually considered Men’s work for a long time. Teenage boys who wanted to join the all-male Knitting Guilds during the 1400’s had to go through 6 years of training before they could take the entrance exam. Despite the fact that women were knitting at this time, only men could join the guilds and knit for an income. Later on, during both World Wars, boys were expected to knit just as much as the girls were. Even now, there are still villages in South America where men are the predominate knitters. “Knitting Madonnas” painted around 1300 CE – 1400 CE show that women were knitting in the home by this time. There’s two ways to look at this, and they’re actually radically different. Some sources state that knitting was such a divine skill that the Virgin Mother must have known how to do it to clothe The Christ Child in seamless clothing. Other sources argue that depicting Mary knitting shows her humility and domesticity, making her more relatable and accessible to the average person. Ancient Socks from Egypt (1000 CE – 1200 CE) seem to be made mostly from cotton, and constructed from the toe up. Despite the fact that some people swear that socks must be made from the top down, and only from wool, the first socks we find are actually made from cotton, and from the toe up. Making socks from the to up actually helps ensure a better fit because you can try it on as you go. But why cotton? Cotton was more readily available than wool in the Middle East. Wool wouldn’t become popular until knitting spread, and trading took off. ← May Events 2017- Back With A Bang!